I've been following a lovely artist for some time now- Lisa Daria's Painting A Day, and have fallen in love with her work in so many ways. Painting daily is her therapy, which I can relate to because painting for me has been a way for me to escape daily stresses and to just 'be', letting my creativity flow from my heart, mind, and soul through my arm and into my brush. Every day around noon I look forward to receiving my daily 'Lisa fix', when she posts her latest painting and emails it to her subscribers. I decided to follow suit...someday. I found myself thinking about this idea often, thinking maybe I should just do it, commit, since I'm a pretty prolific painter plus it just felt 'right'. 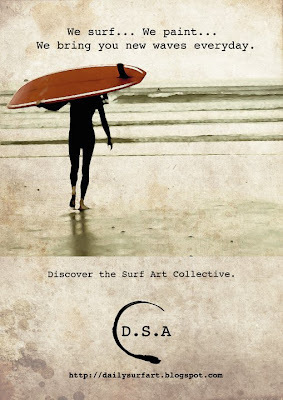 Then, as fate would have it, I stumbled across an artist's collective, made up of several artists, called D.S.A., Daily Surf Art. Created by Olivier Longuet and Ronan Guivarch, it is now an active blog where artists promote each other's art and post new small affordable works daily. 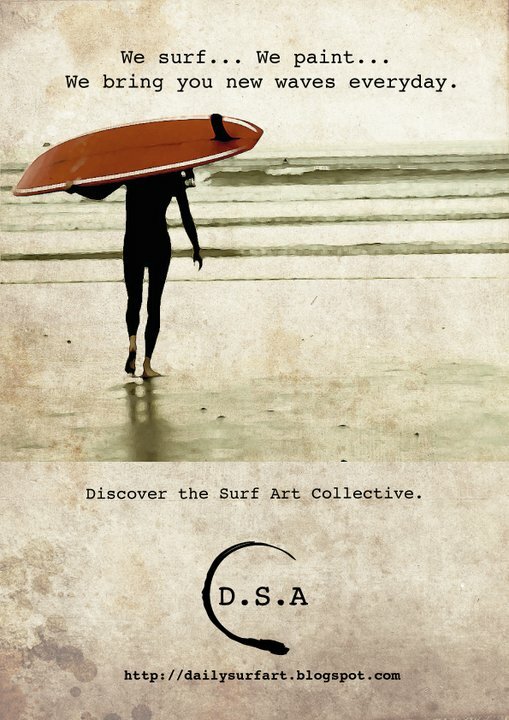 The motto is simple, "We surf... We paint... We bring you new waves every day." Many of the artists contributing to D.S.A. I already followed and enjoyed seeing new work they posted to their personal Facebook pages and websites. Some of the artists are new to me. And all of them are wonderful and talented company to be welcomed among! Be sure to drop by the site to see daily new art by Ollie and Ronan, as well as Bruno Turpin, Lani Gregory, Lisa Riehl, Matt Beard, Pauline Beugniot, Phil Goodrich, Phillip Morrison, Robb Havassy, and Ron Croci, with more to come as the site grows. I'll continue to post new paintings here as well as on D.S.A with little stories of how they each came to be. Happy New Year!